This week in the NFL is a lot like college football: Bit of a downer off a few mega-matchups. Seriously, go find a marquee game in Week 10. Cowboys-Eagles sounds good on paper and probably does fine ratings Sunday night, but neither leads the NFC East and neither would make the playoffs as things stand. Panthers-Steelers? Not bad. Saints-Bengals? Seahawks-Rams? It's just one of those weeks where not too much to get excited about (don't even get me started on the Monday night matchup, which I'm already dreading writing about). So, in lieu of the Browns being the first team to fire their coach this time last week, who's next? Now, these odds were entering Week 9 courtesy of BetOnline, but I doubt they change too much after one week. I'm sure they will be reposted again later this week with any alterations. Maybe no more are canned since we already are to Week 10 and November. At this point, why bother? Although, you do want to get out ahead of the market for a top candidate. Really no super-hot coordinators out there, so it could be GMs look to the college ranks. The three favorites are pretty much whom you would expect, and they were right there with Jackson to open the season: Denver's Vance Joseph (+400), Tampa Bay's Dirk Koetter (+450) and the NY Jets' Todd Bowles (+500) - all three of their teams lost in Week 9. There's no way Joseph or Bowles are back, but Koetter might be. It's instructive to check if ownership has fired coaches midseason previously. Some owners are aggressive, and others prefer to stay the course and finish out a season. A new addition is Arizona's Steve Wilks (+600), but he's not going to be one and done. He was handed the keys to a pathetic offensive team and a rookie quarterback in Josh Rosen. That's what cost offensive coordinator Mike McCoy his job. Green Bay's Mike McCarthy (+600) is interesting. He's reportedly a candidate for the Browns job as we said in the Week 9 Last-Minute News story Friday. The Packers don't fire guys during the season, though. Pat Shurmur (+1000) also is interesting, but Giants ownership is a patient bunch and surely will want to give Shurmur a chance with a living, breathing QB next year and not Eli Manning. Jon Gruden (+2000) is a laughable option with his $100 million contract. Here are some Week 10 early lines that caught my eye. I won't touch on Thursday's game (Panthers-Steelers), my in-depth Sunday matchup (really no truly interesting options; probably Jaguars-Colts) or the Monday night game (Giants-49ers - good God!) as I will be previewing them here individually. Bills at Jets (-7.5 37.5): I'm seriously speechless when it comes to Buffalo quarterback Nathan Peterman. Why is that dude in the freaking NFL? Nate Pete threw three more picks (one returned for a score, because of course) in Sunday's 41-9 home loss to the Bears, Buffalo's third straight game being held to single-digit points. The Bills turned it over four times and had 10 penalties for 163 yards. Peterman threw it 49 times and yet had only 189 yards. He did lead the team with 46 yards rushing. Good job! He simply has to be released; if I'm a Bills player, I'm not taking the field again with that guy under center. It's a good thing that Sean McDermott has job security because that team is an unqualified mess offensively. Too bad because it's pretty good on defense. Maybe Derek Anderson (concussion) or Josh Allen (elbow) can return this week. Bowles' Jets lost their third straight Sunday, and their offense is going backward - it was 13-6 in Miami. Sam Darnold was picked four times. The pick: Jets. Lions at Bears (-6.5, 45): First meeting of the season between NFC North rivals. Chicago is on top of the division at 5-3 following Sunday's blowout win in Buffalo (Bears' fourth straight game vs. an AFC East team). Peterman's suckiness overshadowed some concerning offensive numbers for the Bears as they were held to 190 total yards. The defense had two touchdowns. Jordan Howard rushed for two scores. The Bears were without No. 1 receiver Allen Robinson and pass-rushing demon Khalil Mack for a second straight week due to injury. Monitor their status this week. The last-place Lions traded top WR Golden Tate last week and then went out and laid an egg in Minnesota, 24-9. Matthew Stafford was sacked 10 times and threw for only 199 yards. Detroit was held to a season-low 214 yards as their streak of 25 consecutive games with at least 14 points was snapped. Stafford has been sacked five times or more on 15 different occasions in his career, six of those by the Vikings. The Lions are 3-12 in those games. The pick: Bears. Redskins at Bucs (-2.5, 51.5): Washington remains atop the NFC East but was exposed on Sunday in a 38-14 home loss to the Falcons - the Skins now have a point differential of negative-12 on the year. Washington allowed Atlanta to score in every quarter and total 491 yards on just nine drives. This is just not a team equipped to come from behind. Adrian Peterson was a non-factor with 17 yards on nine carries. Is the fade coming? Tampa allowed 35 first-half points but at least showed a bit of fight after intermission in a 42-28 loss in Carolina. 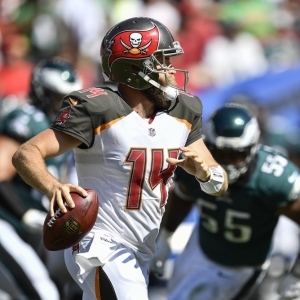 Ryan Fitzpatrick was back as the Tampa starter under center and threw four TD passes but also picked twice. Koetter says he's sticking with FitzMagic over Jameis Winston. Koetter had a terrible call in trying a fake punt with the Bucs on their own 26 down 28-7. The Panthers would quickly score a touchdown. The pick: Bucs.